"On a typical day at work at the Embassy of Papua New Guinea I usually arrive at the office around 8:46-8:50 in the morning depending on the Metro. Once I get to the office I put my lunch in the fridge and make my way to the office. Once I get to my desk I immediately check emails sent to the Embassy of Papua New Guinea and I respond to those emails if necessary. 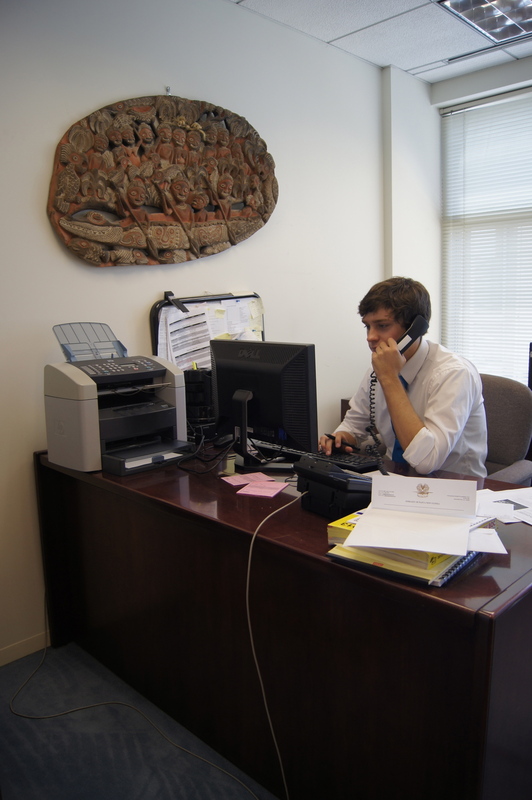 Throughout the day the Embassy receives calls from people requesting the status of their visa. I take down their name and transfer their call to the visa officer and tell her the name of the person calling. Also, during the day people come to pick up their visas and passport and we have them sign their name and signature and date it in a ledger, then we give them their passport. Around 12:00p.m.-12:30p.m. everybody in the office usually takes an 1 hour lunch. Occasionally I will go with my supervisor and pickup lunch if we order food from a place instead of bringing our lunch. For most of the day the interns call and contact different organizations requesting a donation of books from these organizations to send to Papua New Guinea to spread literacy around the country. Occasionally, the interns at the Embassy of Papua New Guinea will attend conferences and talks given at think tanks around the city of D.C. Our boss encourages us to go to as many of these as possible. We usually leave the office around 5:00 p.m. That is a typical day at the Embassy of Papua New Guinea."